I love a good shopping spree. Adding a few necessary pieces to my wardrobe is always a plus. But I often wish that I could be doing good with some of the shopping that I do. Each October, there's an influx of items that can be purchased where a certain percentage of proceeds are donated to various breast cancer charities. You can usually find t-shirts, candles, scarves, and socks among those items. 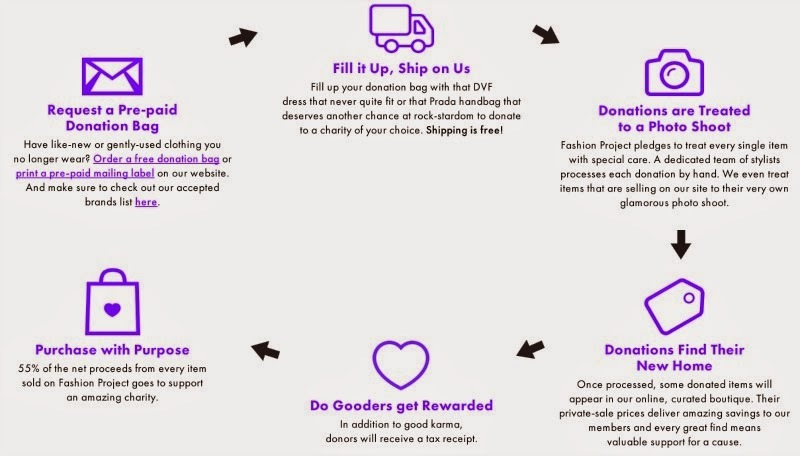 But what if you could purchase your favorite go-to fashion items by your favorite brands on a regular basis while giving to charity? Well, now you can! FashionProject.com combines your favorite brands up to 90% off with your favorite charities as the industry leader in online clothing donation. A portion of the purchase price for each item sold is donated to a specific charity as noted on Fashion Project. 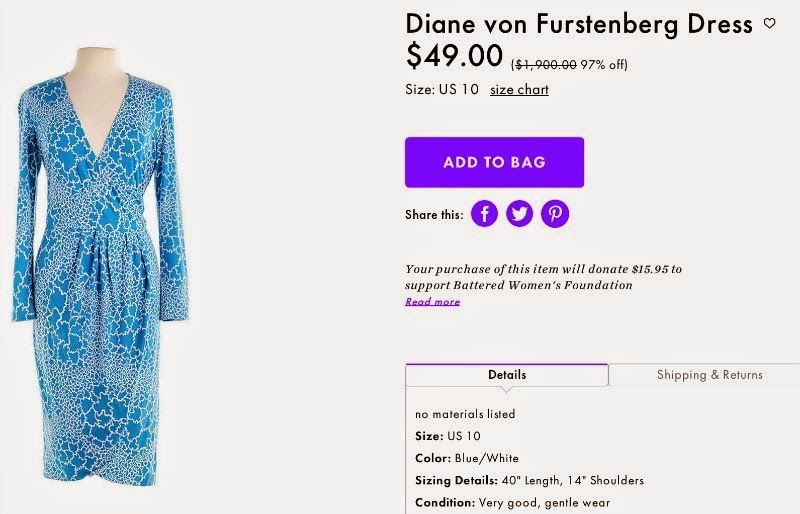 For example, this gently-worn signature wrap dress from Diane Von Furstenburg sells for $49 on Fashion Project with almost $16 going towards charity. Fashion Project specializes in mostly-new, gently worn clothing as well as brand new pieces with tags from your favorite designer brands. They bring the clothes to you at heavily discounted prices and generously offer a portion of the sale price to charities. For a complete list of charities, click here. 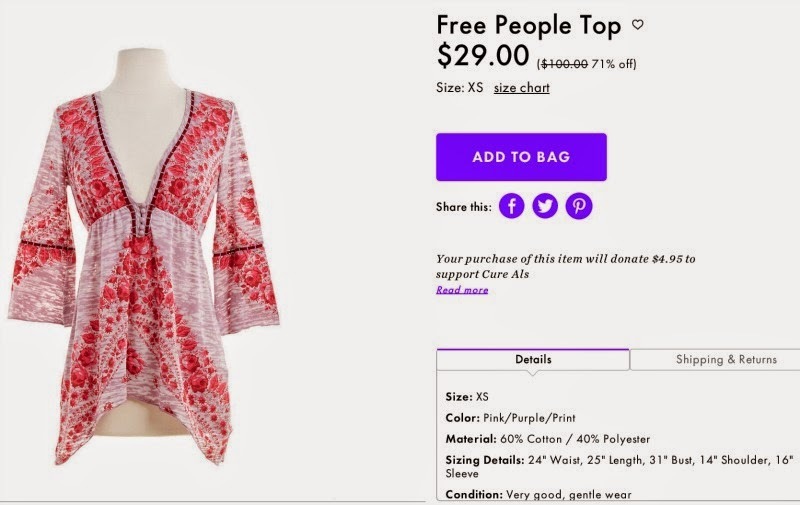 I've got my eye on this top from Free People. It would be perfect for our upcoming vacation. I love knowing that with my purchase, $4.95 will be donated to Cure Als. For every item you purchase, your helping someone in need, whether it's a cancer patient, a hungry child, or a victim of domestic abuse. How exactly does Fashion Project work? Here's a helpful infographic which explains it all. Whether you want to donate clothing or buy clothing, Fashion Project is your solution. To check out the full list of brands that Fashion Project carries, to shop for a favorite item, to view a list of charities, or for more information on Fashion Project, click here. Disclosure: This is a sponsored post. As always, all opinions are strictly my own.